Rarely does the opportunity arise to acquire such a unique residence which has all one would require in term of modern day living. This stunning property is located in one of the most picturesque settings available and is found within close proximity to Barna Village and Gawlay city. 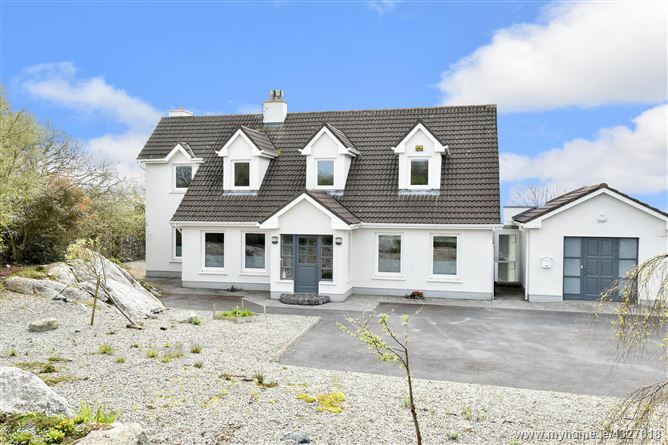 On the instruction of the current owners, O'Donnellan and Joyce are delighted to offer for sale this stunning 5 bed detached family home located in the highly sought after residential area of Forramoyle East, Barna. This is undoubtedly one of the finest properties to come to the market in recent times and has everything you could want from a family home in terms of lifestyle, location and natural amenity. Set on a premier site measuring approximately 0.75 of an acre with manicured gardens and views of Galway Bay & The Clare Hills. 'Seamist' is presented in absolute show house condition with bright and spacious accommodation extending close to 3018 sq. ft. The current owners have spared no expense in creating a wonderful family home environment with careful attention to detail and decor foremost throughout. The accommodation for this magnificent property is comprised of a beautiful welcoming hall with tasteful wooden flooring, a spacious office/study or playroom. This room could easily be used for a downstairs bedroom if required. A spacious family room with feature open fireplace and large windows overlook the private rear gardens. A bright and airy conservatory room enjoys views over the manicured lawns to the rear of the property as well as offering views over Galway Bay and the Hills of Clare. There is also a double bedroom on the ground floor.